Posted By:Unknown | At:1:34 PM Be the first to comment! 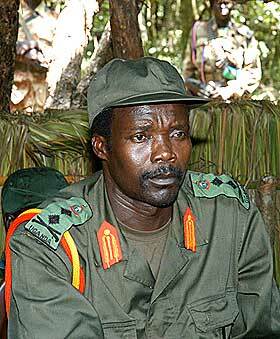 Since 1987, Joseph Kony has abducted more than 30,000 children in Central Africa and forced them to be child soldiers in his Lord’s Resistance Army (LRA). The KONY 2012 campaign employs film, social media, street art, and face-to-face interaction to make the case that the arrest of Joseph Kony this year is one thing we can all agree on. U.S. charity, Invisible Children, has created a documentary film that's exploded online receiving millions of hits. The documentary's aim is to make the Ugandan war criminal famous for his heinous acts, including the recruitment of child soldiers. The hashtags #KONY2012 and #StopKony were trending in the number one spot on Twitter in the U.S., as scores of users, including Diddy and Brandy, posted links to the film and encouraged others to get involved. The film documents the experience of a child soldier in Uganda named Jacob. Click here to learn more about Invisible Children. Click here to sign the Pledge or Donate to the cause.